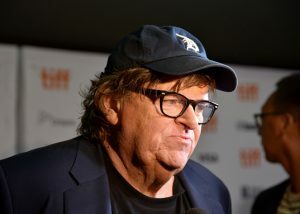 Liberal activist and filmmaker Michael Moore slammed House Minority Leader Nancy Pelosi (D., Calif.) on Thursday night for declaring Democrats will take back control of the House. Moore appeared on "Late Night" with host Seth Meyers, where he was asked which party he thinks will come out on top after the midterm elections next week. "You were here right before the 2016 election and you – there was this predicted blue wave. You were very cautious going into the election. You actually believed Donald Trump was going to win. You called it. You called it state by state, so now I'm giving you another chance. How do you feel about Tuesday?" Meyers asked. Moore said he wasn't going to make the same mistake as another Democrat on a late-night show, referring to Pelosi. The minority leader made an appearance on "The Late Show" with Stephen Colbert earlier this week, where she confidently told the host, ‘We will win.'" "A Democrat, who just automatically announced, ‘We’re gonna win.’ And it’s like, my God, That’s what happened in 2016. Everybody was throwing the party for Hillary before the election," Moore said. "And I think some people stayed home. … Even The New York Times on Election Day in 2016, in that box where they predict, said there was only a 15 percent chance today of Trump winning the presidency." "So you’ve got to throw all that out. You have to quit this kind of predicting nonsense, and you just got to do your job as a citizen," Moore continued. "Everybody has to get off the bench this time." Moore went on to call Trump an "evil genius" and talked about how he "outsmarted" the Democrats in 2016. "They are good at what they do and you should respect the fact that they are able to get away with this. They got away with it with Gore when he won. We didn't do anything about it. They got away with it when Hillary won. We don't do anything about it," he said.